David's New Baby, Big and…Green? 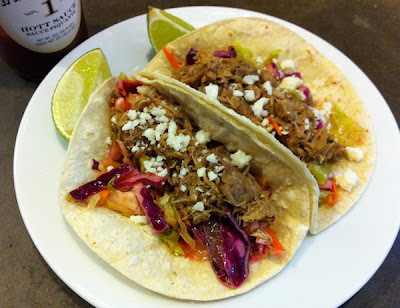 Impromptu: Pork Tacos At Our House! 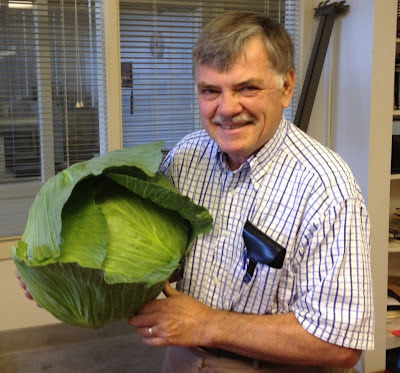 I don't generally post photos of large vegetables, but when this came in over the transom I had to make an exception. That's 13 pounds, 4 ounces of leafy green goodness, friends. And David Kobos (yes, of Kobos Coffee fame) says he's got six more coming on. You can read the secret to his garden success in "How to Make Dirt." And what's he planning on doing with these babies, you ask? Stay tuned! 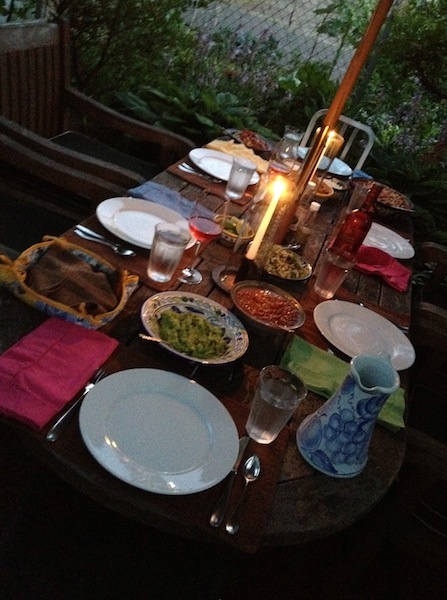 The plan had been in place for weeks, and we were looking forward to having a Saturday night dinner on the deck at the home of good friends. We'd even been given the menu, the better to whet our appetites in advance of the evening: cocktails and tomato-basil bruschetta to start, then grilled pork ribs, corn salad and the hostess's gramma's green beans. Boysenberry pie for dessert. Yeah, we were drooling, too. Saturday morning dawned warm and sunny, with the promise of a beautiful, not-too-warm Portland evening for the dinner. Then around mid-morning we got a call. A painting project had run over schedule, an unexpected memorial service had come up for that afternoon. Could we reschedule the deck dinner and go out instead? Maybe margaritas and Mexican at a place with outdoor seating? Though there are several great places in town that fit that bill, I'd really been looking forward to spending time with our friends without the distractions and constraints of a restaurant meal. Why not just change locations and come over to our house? Dave's margaritas are as good, if not better, than any I've had out and, sticking with the Mexican theme, I could throw some pork on to braise for tacos and we could pot luck the condiments. After hanging up I looked around, realizing the house was a complete shambles. Ack! Good thing we were eating outside…and we could clean up enough that, in the dim evening light, it might not look too awful. Ready to go…take a seat! On the way to the store I ran into my neighbor Susana, who waxed poetic about the dinner she'd made the night before featuring short ribs braised in apricots and cherries. We agreed it would be perfect for the pulled pork I needed for the tacos so, armed with her inspiration, I bought the necessary ingredients, came home, threw it all together and three hours later had the most luscious pulled pork ever. And our dinner that evening? Perfection…just like we'd planned it all along. Heat the oil in a large Dutch oven over medium-high heat. When it shimmers, add onions and garlic and sauté till translucent. Add remaining ingredients and bring to a boil. Cover and place pot in oven for 3 hours until pork is falling apart. 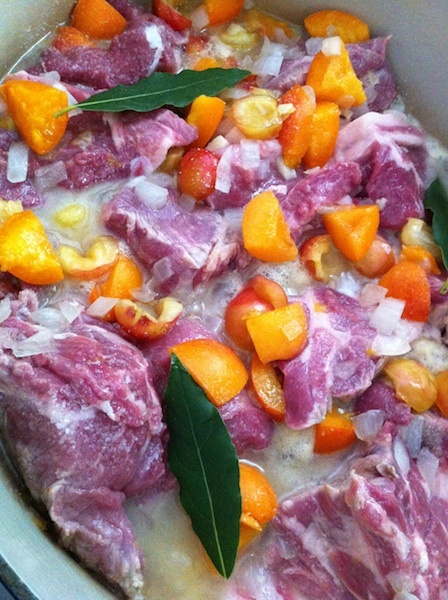 Remove pot from oven, and transfer the chunks of pork to a large platter, leaving cooking liquid in pot. 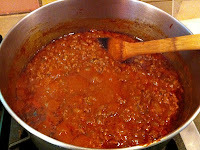 Bring liquid in pot to a boil, stirring occasionally to prevent sticking, and reduce until most of liquid has evaporated and it is a syrupy consistency. 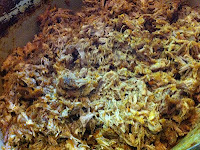 While liquid is reducing, smash pork with back of spoon or pull apart with a fork. When liquid in pot has finished reducing, add pork back to pot and combine. This pulled pork would be amazing with any recipe calling for pulled pork, and is infinitely variable with any seasonal fruit…think plums, peaches, apples, etc. You could also add whole chiles like ancho or poblano to give it some heat. There are very few things that cause me to panic. And even fewer when it comes to cooking. But one of the ingredients I consider a must-have-on-hand is garlic, preferably several heads. Like the Holy Trinity of New Orleans cooking…celery, onions, green peppers…garlic and onions are revered in my kitchen. In this essay contributor Anthony Boutard reveals how the Allium sativum found a home at Ayers Creek Farm. 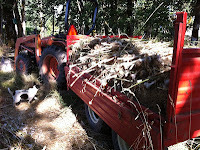 About eight years ago we received a call from a young couple who asked if they could grow their garlic at the farm. It was early autumn and they had just moved out to Oregon and had an extensive garlic collection they needed to plant immediately. The situation was dire, so we agreed to consider their request. Farm land is either rented for cash or a share of the crop. Cash rent is the most common arrangement, but sharecropping offers some advantages. A few years ago, we agreed to a share in wheat that was grown on the farm. We earned considerably more with this arrangement, but we had to wait longer for the money. He stored the wheat for two years and the price went up nicely. The share is typically a third of the crop for the landowner. Tito (at left) inspecting the crop. 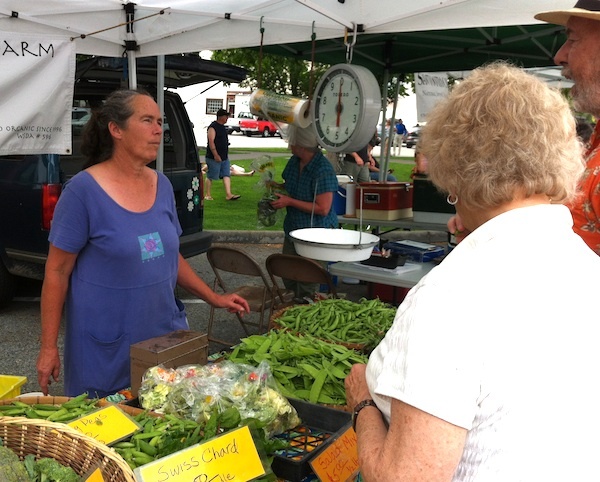 When Josh and Sarah approached us, we were bulking up on crops for the winter market and it made sense for us to take a share of the actual crop. They would need us to do tractor work, irrigation and other odds and ends, making any sort cash arrangement difficult to calculate. We settled upon a one-fifth share for us. 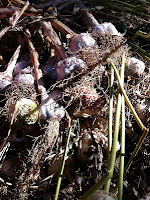 It was generous to them, but we also benefited because it allowed us to share in a very diverse collection of garlics. They had been featured in the New York Times food section, and we referred to them as the Famous Garlic Farmers in earlier newsletters. 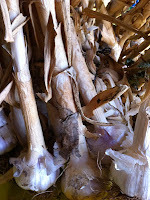 After four years, they found a place of their own and still grow garlic [at Sacred Organics - KAB]. Josh also works in the produce department of the Cedar Hills New Seasons store. So we will see him over the next few weeks while delivering the Chesters. Somehow or another, this stinking lily bulb composed of fat storage leaves has built up a fair measure of mystique. Talking about garlic, things can get complicated pretty quickly. If you are only growing garlic, that's fine, but we have too many things swirling around to tolerate much nuance. Early on and endearingly earnest, we labelled every variety sold at the market and kept them separate for planting. The market labels lasted just a couple of weeks; they disappeared when people starting asking what variety we would recommend for fish or aioli. With our forestry and natural history backgrounds, we are inclined to think in terms of populations rather than narrowly drawn varieties. 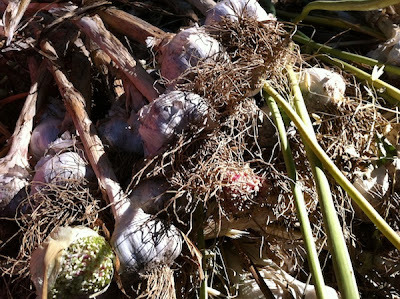 Now we select about 100 pounds of the best garlics and plant them. Eliminating the organizational demands allows us to plant more and harvest faster. The harvest took more than a week early on, and now two of us have everything dug, bundled and hanging in two days, with help from Sylvia, Carol's sister. There are two major types of garlic, hard neck and soft neck. 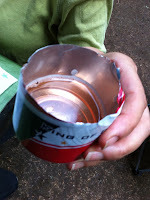 The hard necks are the most flavorful but do not store for a long time. These are the bulbs we are bringing to the market now. The soft necks are less complex in their flavors but remain in good condition well into the springtime. We will sell these when the hard necks are all sold, typically starting in December. 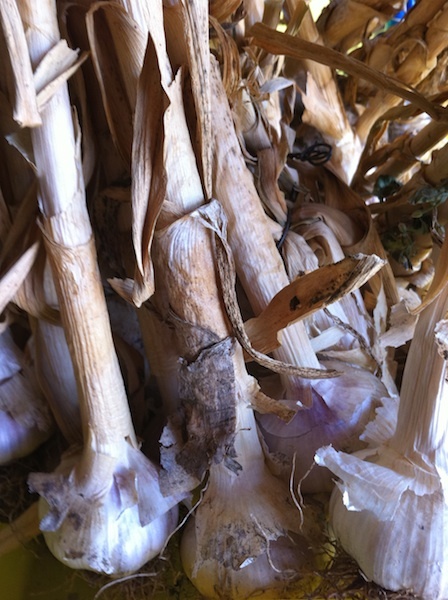 As you use our garlic, you will still see traces of the diverse collection brought to our farm by Sarah and Josh. On the other hand, the conditions and character of Ayers Creek Farm and its owners are shaping the population as well. If you consider the wonderful names of garlic varieties, they almost always indicate a region of origin. 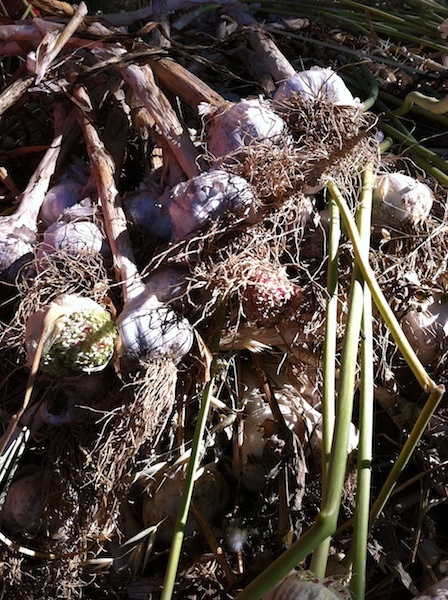 Over time, this population of garlic will be tightly linked to the soils and management conditions of Gaston, just as 'Creole Red', 'German White' or 'Georgian Crystal' are linked to their regions. Maybe it's time to call the hard neck 'Wapato Wed'. When I was offered a trip to Washington's Lake Chelan and Wenatchee regions courtesy of the area's tourism folks, I jumped at it. We'd driven by there on a previous road trip up to Canada's Okanagan last fall, and I couldn't get over how verdant this fruit-growing valley was, lying as it does at the confluence of the Wenatchee and Columbia rivers, with arid, sage-covered hills rising up from the valley floor. It's an easy five to six-hour drive, depending on whether you stop for lunch or a beverage at one of the charming small town cafés along the way. Whether it's the old-timey Liberty Cafe between, appropriately enough, Liberty and Cle Elum, or, like us, at the more pubby environs of the Snoqualmie Brewery and Taproom in Snoqualmie, it'll give you a chance to stop, unbend those road kinks and get your grub on. Road trip advantages: our own liquor! Our first nights' lodgings were in a sumptuously appointed condo in the brand-new Lake House in Chelan. From our fourth-floor deck overlooking the lake we had a gorgeous view of the orchards and vineyards ringing the southern end of the 55-mile-long lake. Unfortunately the view also included a front-row seat for the go-cart concession that operates from 10 am to 10 pm every day, right on the lake's bank. The good news is that the room was well soundproofed, so with the glass sliding doors closed, narry a roar was heard and the view (above) was preserved. 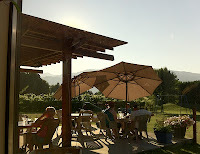 The patio at Wapato Point Cellars Grill. Dave, taking advantage of the copious space afforded by our Mini Clubman, Chili, had brought the travel case with makings for our favorite cocktails. 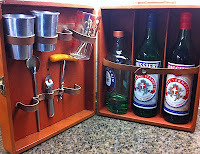 With a small market next door for any forgotten supplies (like limes for G&Ts), we were all set. So, fortified after the day's drive, we headed out for dinner at Wapato Point Cellars Grill Room in the adjacent town of Manson. 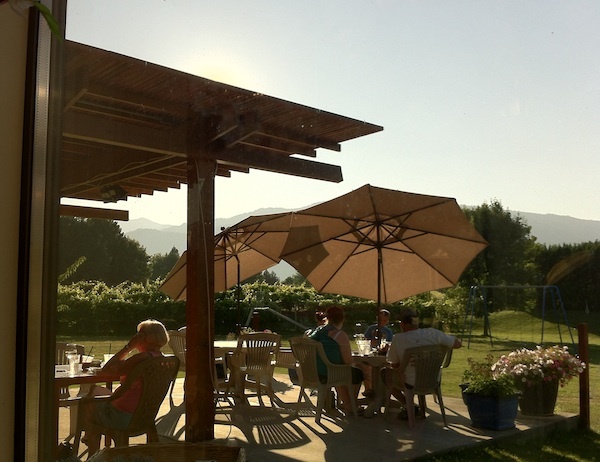 Owned by Steve and Bobbi Kludt, who planted the first commercial vineyards in the Chelan Valley in 1988, the Grill Room has the feeling of sitting on a very elegant patio with glass walls along two sides that look out onto a beautiful green lawn and rows of grapes. There is also patio seating available, but since the temperature was still hovering in the 90s outside, we opted for the view from inside. The salmon at the Grill…delicious! 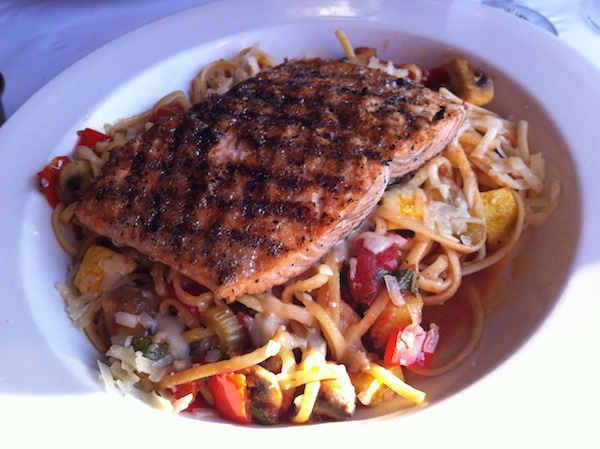 The food is fresh, well-prepared…Dave's prime rib was perfectly roasted and my salmon was tenderly grilled…and the portions were gigantic, with a single entrée plenty for two. The Wapato Point Cellars '09 Clos Chevalle Reserve Pinot our server suggested was more in the Burgundian vein than the overblown California style, and matched our mains quite well. The vegetable sides were terrific, and when I asked about them, I was told that Steve and Bobbi began growing the vegetables for the restaurant last year. 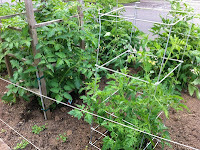 Mostly greens and tomatoes, customers responded so enthusiastically that the couple is expanding the crops they grow on their farm with suggestions from chef Sean Akin, who's keen to use more garden-grown vegetables, fruits and herbs on the menu and in the bar. 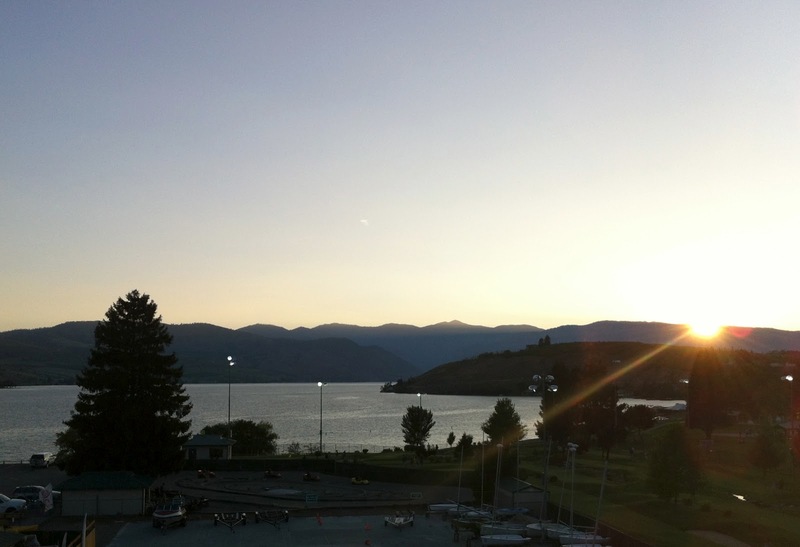 The town of Chelan is small, just under 4,000 people, with the main part of town clustered around the southern end of the lake. Its still got that East-of-the-Cascades small town feel, with single-story storefronts lined along the main street and few of the resort-y stores you might otherwise expect. Campbell's, one of the waterfront resorts lining the lake downtown, has a bistro with an outdoor veranda as well as a very English-style pub indoors. We'd have taken the bistro's veranda but for the still-exceptional temperature outside, so the air-conditioned pub with its selection of local microbrews and excellent fish'n'chips was a better fit for our needs. 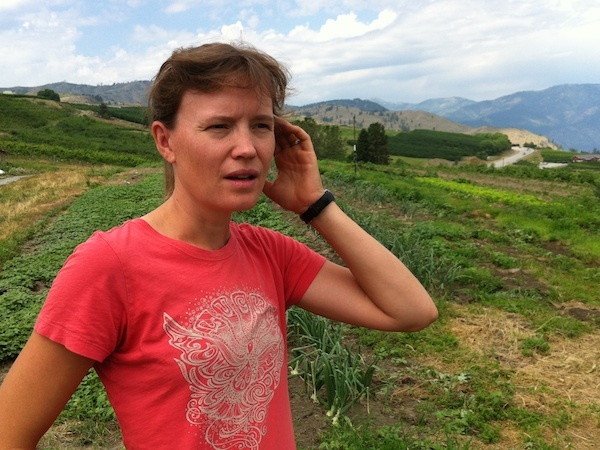 Liz Eggers of Grouse Mountain Farm. 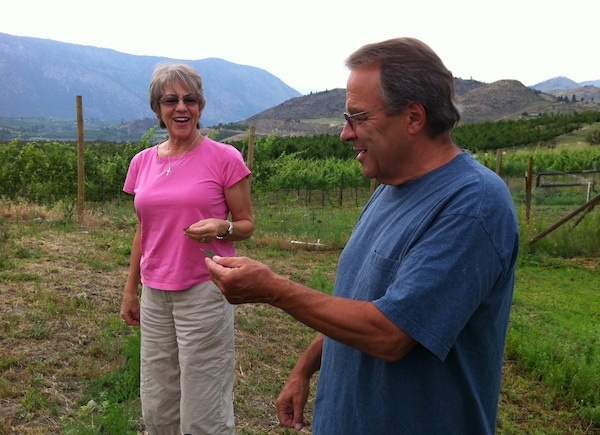 Bobbi and Steve Kludt of Lake Chelan Winery. The evening's activity was a drive along the lake to tour Bobbi and Steve's farm, and we ended up having dinner at the Kludt's original Lake Chelan Winery. Several years ago his farm crew volunteered to man a barbecue pit behind the tasting room during the summer evenings, and it has become a must-stop for wine tourists who are in need of some solid chow after a day out on the route. A bit of local news: we heard that Steve has received funding to start production of hard cider, so look for some Lake Chelan product to start flooding the market. Rachel Evans of Sunshine Farm. 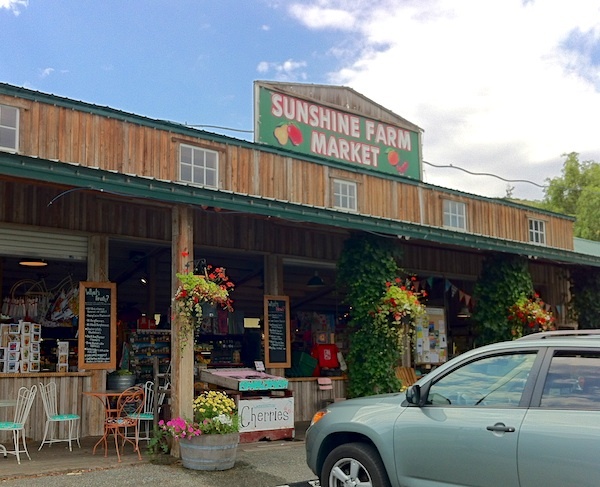 The last stop on the Chelan leg of the trip was at Sunshine Farm, a fourth-generation farm on the hills above town. 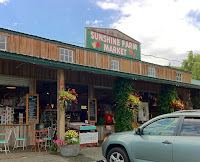 Originally 100 acres of Red Delicious apple orchards, it's been transformed by the most recent generation into a diverse farm including orchards, llamas, grass-fed beef and lamb, a guest house on the lake and five acres of certified organic crops that supplies its own CSA, the farm store and area restaurants. Its sloping location is also ideal for growing wine grapes, and Rachel Evans and her husband, winemaker Guy Evans, are producing wine under the Tunnel Hill Winery label. They actually live onsite in a historic stone cottage known as "Ma Rainier's place" that was built from the rock left from the excavation of the highway tunnel in 1937. It's where they're raising their daughter with hopes that she'll be the fifth generation to join the family business. Read about the second leg of this road trip in Wenatchee's Winning Ways. Details: Tour de Hives organized by the Zenger Farm Bee Group. Sun., Aug. 18, 1-4 pm; post-event gathering at Lucky Lab at 915 SE Hawthorne, 4-6 pm. Tickets $5-$15 sliding scale with preregistration. For those too squeamish (or allergic) to want to put in their own beehives, there are ways to promote these infinitely useful invertebrates. One Northeast neighborhood has organized the Sabin Bee-Friendly Front Garden Tour that shows how easy and beautiful it is to plant a bee-friendly habitat. With 30 neighborhood homes participating, the tour is self-guided and you can peruse the gardens at your leisure all summer long. Even more helpful, there's an audio track available narrated by the homeowners themselves talking about their gardens. It's a great opportunity to learn a lot with little effort other than taking a walk through this lovely area. Details: Sabin Bee-Friendly Garden Tour. Map available online or at Livingscape, Garden Fever or the Backyard Bird Shop Fremont location. Narrated audio track can be heard at 503-205-0326. For more information e-mail Diane Benson. 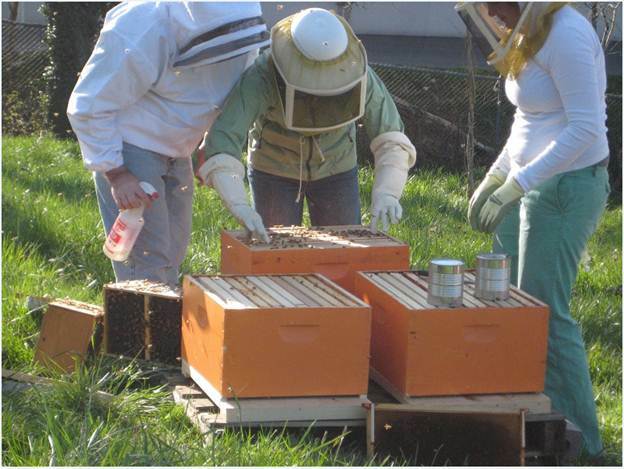 Zenger Farm Bee Group meets monthly and cares for the farm's hives. Naomi's Organic Farm Supply has classes, information and supplies. Ruhl Bee Supply, at 114 years the oldest bee supply company in town, has classes, info and supplies. Livingscape has supplies and information for home beekeeping. Bee Thinking has supplies and information about top bar hives. Portland Urban Beekeepers meets monthly. Portland Metro Beekeepers Association meets the second Thurs. of the month. 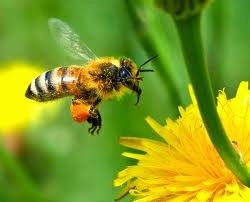 Tualatin Valley Beekeepers Association meets the last Wed. of the month. Clark County (WA) Beekeepers Association meets the second Thurs. of the month. Oregon State Beekeepers Association has listings and information. 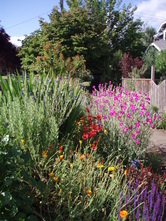 Xerces Society is an organization dedicated to promoting and preserving pollinators. Lots of info here. 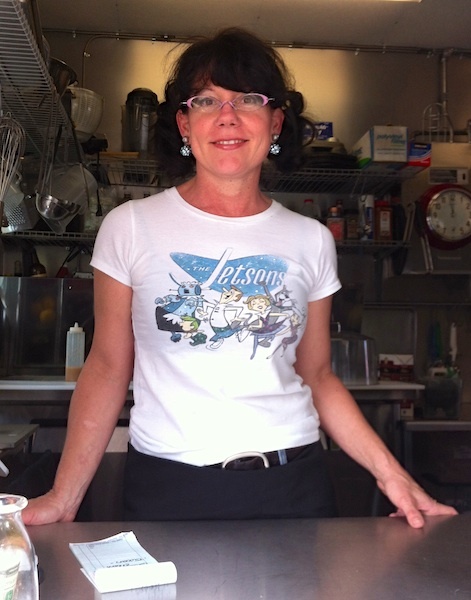 If you somehow miss the bright pink food truck with its flock of pink flamingos, look for the Jetsons vintage t-shirt and the beaming smile on the face of Kimmie, the owner and head Retro-teer of the Retrolicious food cart. 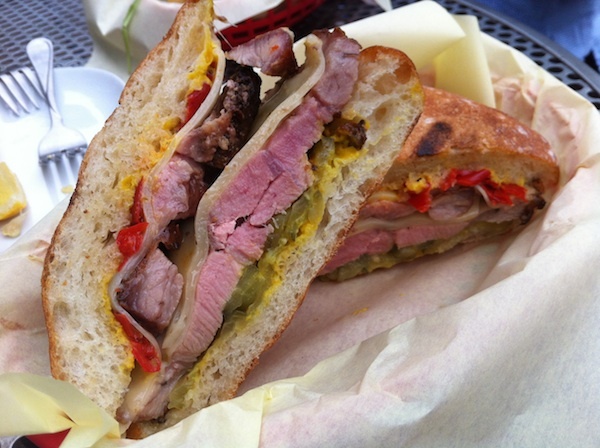 A friend and I stopped in at lunchtime and I was instantly hypnotized by the description of their version of the Cubano sandwich called Damn That Castro. 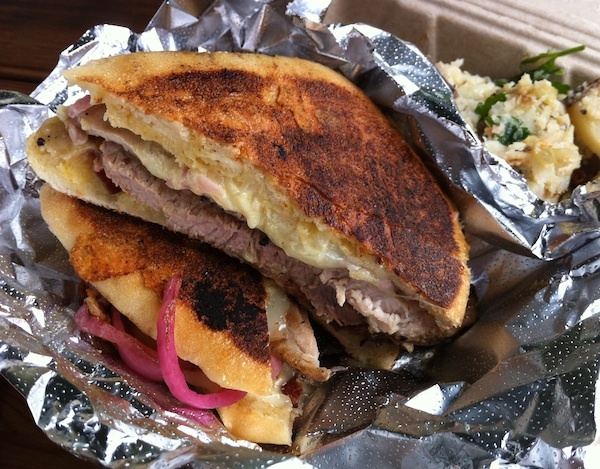 They give it the panini treatment, that is, pressed and grilled, yet it was still a substantial hunk of a sando, with big slabs of fall-apart tender pork, pickled onions, aioli and just the right amount of melted, gooey cheese. The potato salad on the side was of the vinaigrette-dressing style rather than a mayo-egg version, and quite nice. Word has it their crispy chicken and mac'n'cheese is awesome, too…and with a BLT, meatloaf, grilled cheese and chicken-and-waffles, this place looks like a hit. 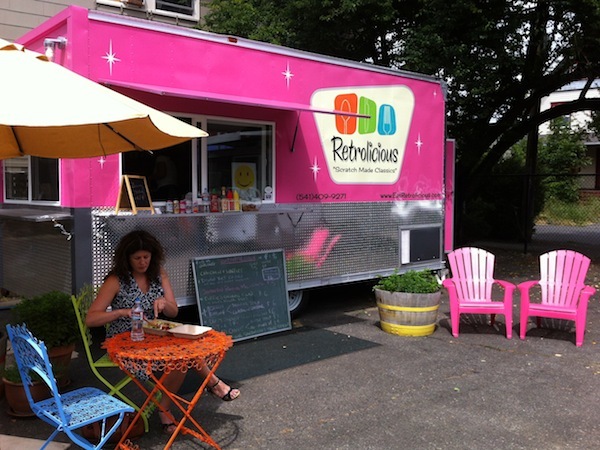 Details: Retrolicious, 1930 NE Everett in the Green Castle cart pod. 541-409-9271. 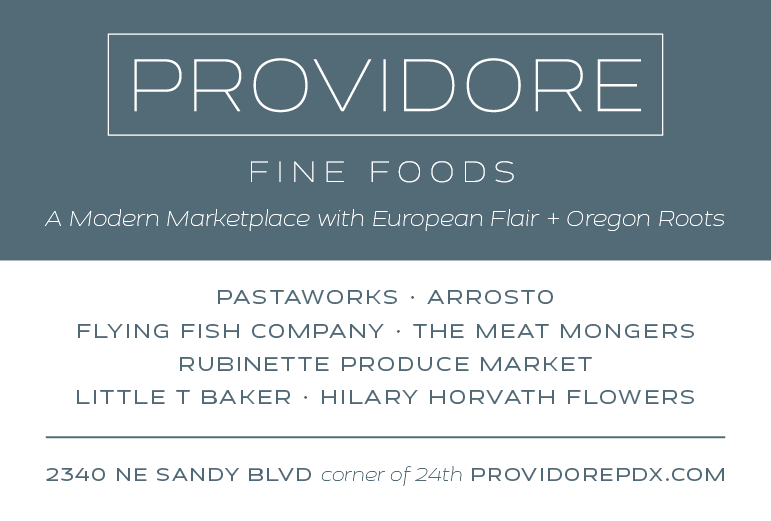 Ever since my brother moved his wine shop, Vino, to the perennially hip-and-happening food mecca that is 28th Avenue, I've been watching the corner of 28th and Burnside transform from depressingly dingy to downright dazzling. And with the addition of Pah Dee Thai in the spot formerly occupied by the scary darkness of Hungry Tiger Chinese, the transformation is complete. On a recent summer afternoon the sliding windows were open and tables were dotting the sidewalk, making the walls almost disappear and allowing the breeze to cool the intimate yet comfortable interior. A friend and I opted to share a couple of plates, and we were knocked out by the lemongrass shrimp salad. 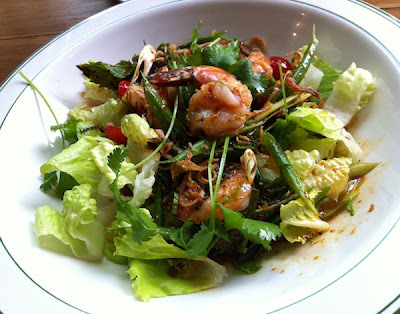 A base of romaine lettuce has enough structure to stand up nicely to a scattering of cilantro topped with sautéed tail-on shrimp and lemongrass in a warm fish sauce-inspired dressing. So fresh and full of the deep umami-ness that can prove dangerously addictive, the memory of this dish will have me coming back again, and soon. Details: Pah Dee, 6 SE 28th Ave. 503-360-1453. The reasons I love contributor Jim Dixon's recipes are that they're invariably easy, they use seasonal (and even leftover) ingredients and he's not dogmatic in his approach. 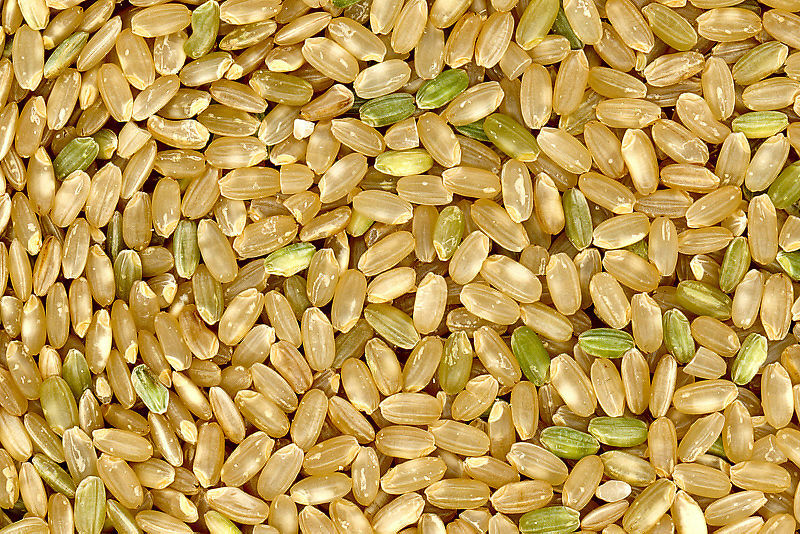 In this post he takes on that most seventies of grains, brown rice. And, as he mentions, you should feel free to substitute good quality brown rice for the Kokuho. 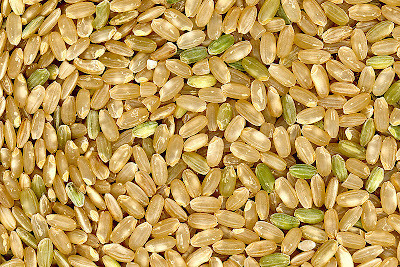 I love the brown rice I get from Koda Farms. I never really liked brown rice before I started eating Koda’s Kokuho Rose heirloom varietal, but to be fair, that other stuff was probably cooked poorly. The Koda rice requires some effort (soak, cook, rest, fluff, rest; I use a rice cooker, and the whole process takes more than an hour) to taste good, and maybe if all that brown rice I didn’t like had been given the same attention it would’ve been better. I don’t mind taking the time to make the Koda rice, but lately I’ve tried using the Italian approach: cook it like pasta. Add the rice (without soaking) to a pot of well-salted boiling water, keep it boiling for 30 minutes, drain, return to the pot and let it sit, covered, for 15 minutes. The rice emerges fluffy and a little less sticky than the rice cooker version. Sometimes I want that, like when I’m serving the rice alongside something hot and savory. But the Italian method gives me the perfect rice for a composed salad like this. The “composition” of most of the salads I make depends on what kind of leftovers I have. 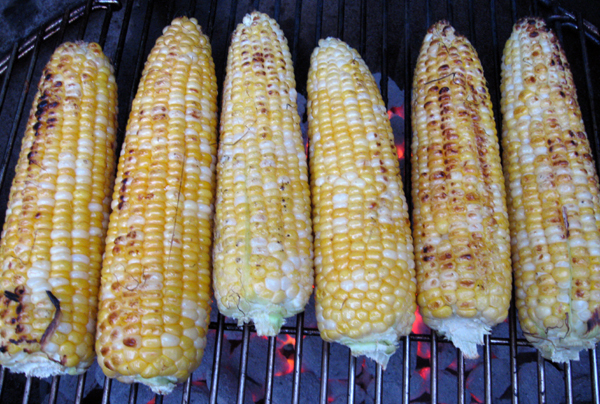 In this case, a few ears of roasted corn from a few nights earlier. I sliced the kernels off the cob while a chopped onion soaked in a bowl of Katz Late Harvest Zinfandel vinegar. I combined all that with a handful of mint from the garden, chopped roughly, and a generous pour of extra virgin olive oil. A good sprinkle of flor de sal and it was ready. You don’t need leftover corn to make rice salad. Just take a look in the refrigerator, add something from the garden or market, and use plenty of good olive oil and vinegar. But have some rice ready to go, too. Decisions, decisions. That's what it's all about, even on a farm. Contributor Anthony Boutard discusses his process when it comes to choosing what works for Ayers Creek Farm. As well as what doesn't. A couple weeks ago in the Hillsdale Farmers' Market newsletter, assistant manager Sarah West noted that one of the most frequently requested foods at the information stall are organic strawberries. It interested us because we have often toyed with the idea of growing strawberries, and the lack of this crop illustrates some of the challenges farmers face when deciding what crops to grow. As organic growers, our stall should put to rest the claim that certain crops can't be grown organically. That is a prevarication, not a fact. Dependency upon synthetic crop inputs is relatively recent, and there is no crop that we can think of can't be produced without them. In fact, strawberries have naturalized on our farm and we find the occasional plant with the most sublime fruit you could ever dream of. 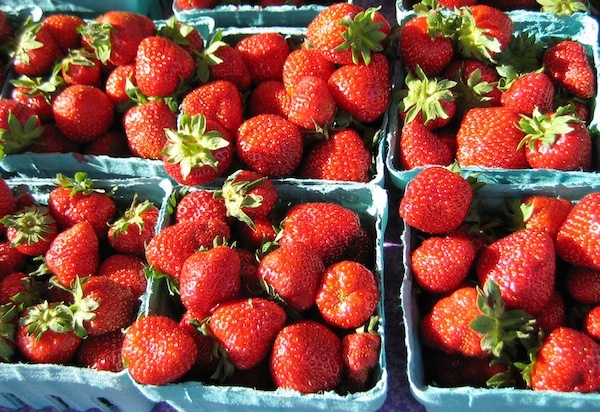 The lack of organic strawberries has nothing to do with organic farming, instead it is largely due to the historical structure of agriculture in Oregon. In 1965, there were roughly 14,000 acres of strawberries harvested in the state. Most of the crop was sent to processors for making jam and pie filling. By 1990, the acreage had dropped by half, and in 1999 it halved again to about 3,500 acres. Currently, the harvested acreage is fluctuating between 1,700 and 2,000 acres. These data show the change that has happened in the industry. Most of the strawberry producers gained their experience in the processor market and, as it collapsed, shifted to fresh market as the processors left the state or started using imported fruit. Historically, many of those growers had roadside stands and, as the shift occurred, they used that experience to move into fresh market. 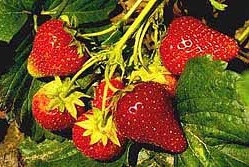 Most of the strawberry acreage shifted over to a more lucrative form of farming, nursery production. There was no tradition of organic strawberry production in Oregon, so it is hardly surprising that as the industry shrank all of the remaining strawberry growers used synthetic inputs. At this point, growing fresh market strawberries is an "old sector" and there is no economic incentive for a young farm to make the substantial investment to grow the crop. Berry prices across the board are too cheap for a farmer considering a new planting. 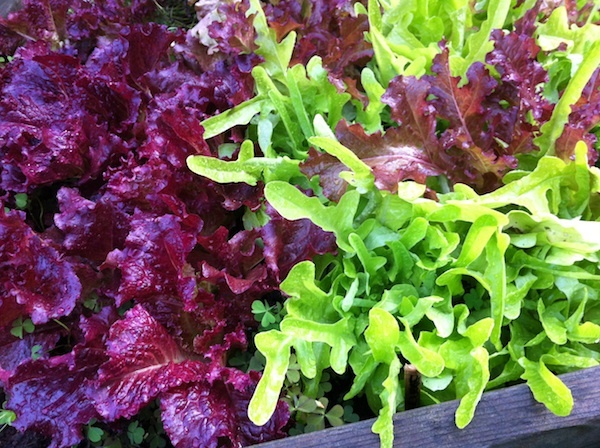 Beets and lettuce are a better investment for people entering the business: small package of seed, lots sweat equity with a low risk of failure due to weather. With fruit, a few hours or days of ill-timed rain and the farmer has to contend with the disappointment of losing a substantial chunk of income, as well as upset customers. So the cohort most likely to bring an expertise in organic farming, young farmers, have little reason to consider fruit because the older cohort, and that includes us at Ayers Creek, have made our investment and suppress fruit prices. There is an additional twist that is integral to our character as organic growers, and the reason why we answer "no" whenever we consider strawberries. 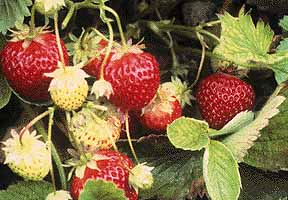 Over the past half century, strawberry varieties have been selected and reselected in breeding programs that use synthetic fertilizers, aggressive soil sterilization, fungicides and insecticides. At the present, there are no varieties that have gone through a selection process for robust performance on organic farms. So we would be starting with debilitated plants that are essentially chemically dependent. In fact, all of the commercially available strawberry plants are grown in chemically fumigated soils and that sets up additional restrictions under the rules of organic agriculture. That is an additional barrier that can change, but as long as the price of strawberries remains so low there is no economic incentive for a shift toward organic breeding programs. Those naturalized strawberries we encounter from time to time gave us an idea about seven years ago. We dug up several hundred and planted them in a managed field. Our goal was to find a population with good natural resistance to disease and replicate the interesting diversity of flavors we found in those volunteers. Similar to what Frank and Karen Morton do with their lettuces. The wildlings, as we called them, were really good and we discovered we were really bad at growing strawberries. The farm has to be a good match with the farmers' personality, and we grow other crops with greater pleasure and success. Smaller photos of strawberry plants from OregonStrawberries.org. There are some traditions in my family that are not to be messed with: Christmas dinner means turkey and fixin's…no suggestions of ham, lamb or other funny business allowed. Same goes for Thanksgiving. 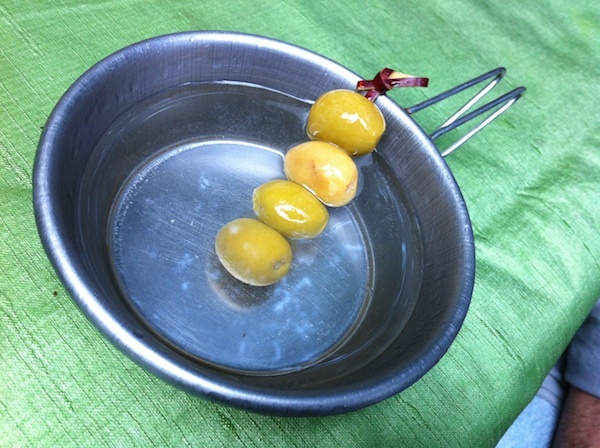 And Friday evenings are invariably kicked off with Dave's martinis garnished with Spanish anchovy-stuffed olives. Instant classic: the Sierra cup martini. Now it looks like the fourth of July is becoming another don't-mess-with-the-best formula: a minimum of three nights of tent camping with a group of four couples sharing food and drink at what has been officially voted (by us) as a 10-out-of-10 campground, Paradise Creek in the Gifford-Pinchot National Forest just north of Carson, Washington. 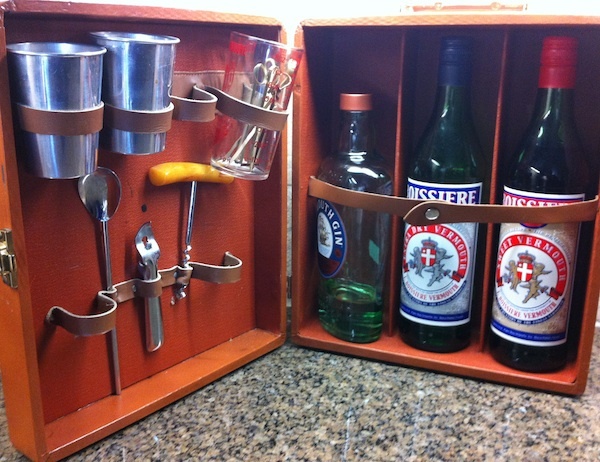 Classy glassware? Who needs it? A mere 90 minutes from Portland, it's pretty primitive, meaning no showers, flush toilets or hook-ups for big rigs. But that also means it's devoid of roaring generators, loud music and crowds of marauding children on dirt bikes. Instead the air is filled with the smell of campfire smoke and the sound of the small creek that flows by, and the night sky through the trees is studded with millions of stars. 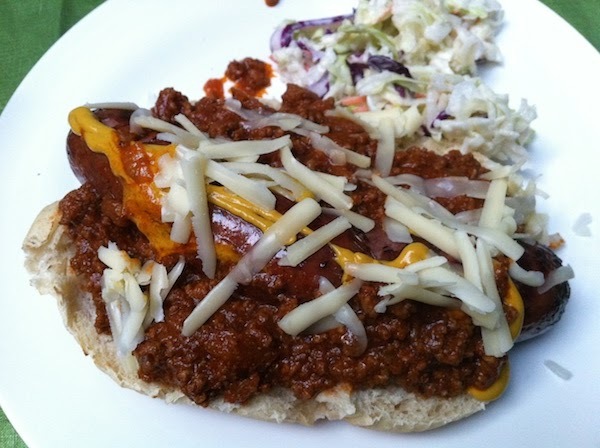 This year we had dibs on making dinner the first night, so instead of trying to relive the success of last year's campfire posole I decided to try my hand at that hallowed American specialty known as the Coney Island hot dog. What I came up with is definitely a twist on the traditional, but what can you expect from someone who grew up on the left coast? And the dogs were no Ball Park Franks or even Hebrew National, but a selection from local purveyors Olympic Provisions and Chop. Both types got raves, by the way, though I have to say I really liked the flavor and heft of the Chop dogs. And the sauce is one I'll pull out for a backyard BBQ soon, sided by some potato salad or coleslaw. Heat a large Dutch oven on medium heat and add oil. When it shimmers, add ground beef and brown. Add onions and garlic and sauté till tender. Add garlic powder, vinegar, chile powders, cinnamon, cumin, salt and allspice and stir until fragrant. Add remaining ingredients and bring to a simmer. Continue simmering for 3 to 4 hours, stirring occasionally to make sure it doesn't stick. Makes about 10 cups of sauce. Read other Camp Stories in the series: Trout Creek Campground, Shadow Bay at Waldo Lake, LaPine State Park, Indian Crossing Campground, Frog Lake Campground, Patrick's Point State Park, Harris Beach State Park and Moss Creek Campground and last year's trip to Paradise Creek. A picture is indeed worth a thousand words. All I have to do is go back one month and look at the photos of the garden back then. Tomato starts just put into the ground. Teeny baby lettuces beginning to sprout from the seeds I'd planted. Then take a gander at the salad greens above taken a couple of days ago…and that's after two hefty harvests the week before. 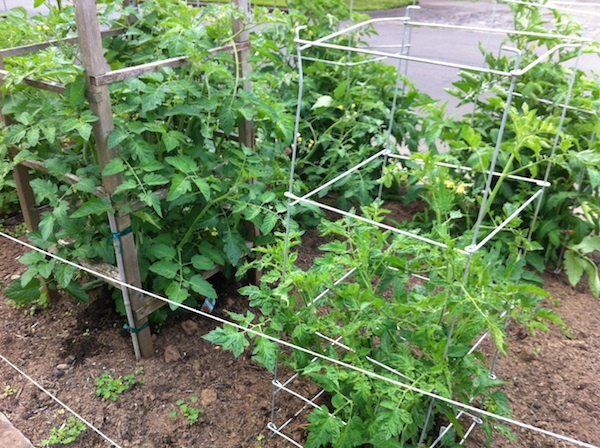 The tomatoes (left), as foretold by wise gardeners I talked to, have taken off with the advent of warmer soil temperatures, some even starting to set fruit. The kale, still in the baby stage, should provide some good eatin' later in the summer and throughout the winter and spring. It's still a little early to tell if it'll be a good year for peppers, but hope springs eternal. See? There is a reason I write this blog. Even if it just reminds me how quickly my garden grows. I have to admit that I don't get into our neighborhood Freddie's very often, and when I do it's a quick in/quick out sort of trip. So when I saw this electric car charging station in the parking lot, I got…well…all charged up, even though our Chili isn't that sort of car. 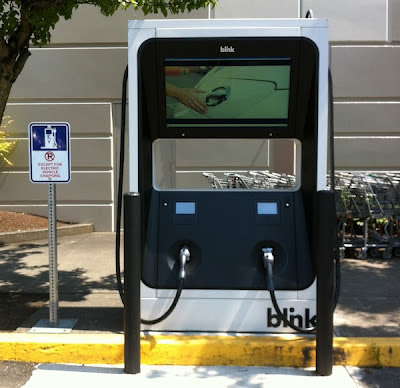 Apparently ECOtality, the electric transportation and storage technologies company, struck a deal in 2011 with Kroger, which owns Fred Meyer, to install these chargers at designated stores Oregon and Washington. The Hollywood location, at 3030 NE Weidler St., was the first in the nation to install a fast-charging station, which can charge a Nissan Leaf's battery with up to 80 percent battery capacity within 30 minutes. More fast-charging stations are planned at other locations in the near future. Just in time to pick up a few items at the store, methinks. Interesting strategy! Right after we moved into our NE Portland neighborhood I made a complete food of myself after smelling the intoxicating aroma of smoky barbecue coming from someplace nearby. I wandered down the street, nose in the air, trying to discern from which back yard it was wafting. Fortunately, the surprised neighbor I hailed from the sidewalk was kind enough to offer me a rib rather than sicking his dog on me. I similarly lose my senses when it comes to the herbs and spices of the various regional cuisines of India. All it takes is a hint of curry or tamarind, and I'm totally in the thrall of their sumptuous richness. 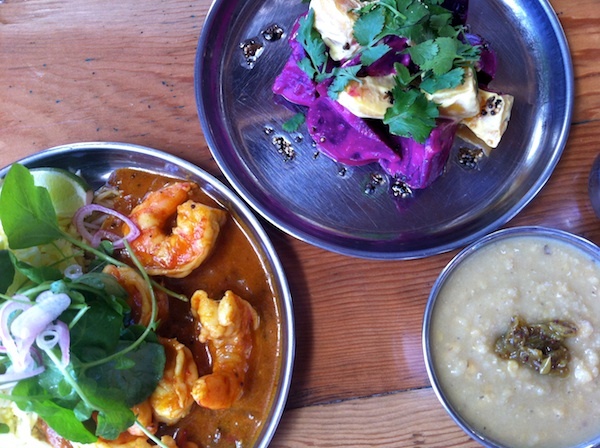 Sadly, Portland has very few restaurants that do this country justice, most content to offer copies of the same old curries and stews, dals and raita. Now comes a glimmer of hope that…be still my heart…we may be blessed with an establishment that truly understands this most diverse of culinary traditions. Troy McLarty, an alum of Chez Panisse and, more recently, at the much-lauded Lovely Hula Hands, has opened Bollywood Theater on NE Alberta, and a recent lunch there with a friend bodes well for the future. 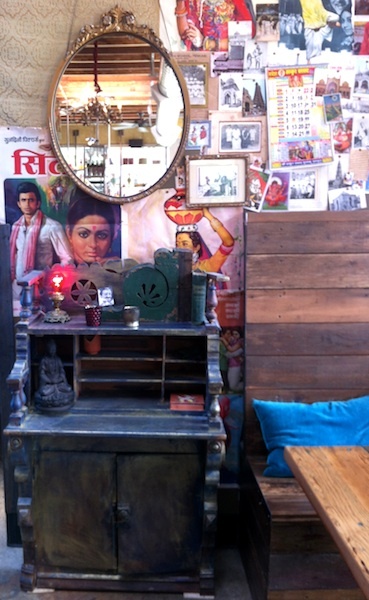 Charmingly appointed with Indian tchotchkes and wall murals, Bollywood Theater does much, much more than get the sound track right. The menu, comprised of small plates of street food as well as curries (called Thali Meals) and vegetable sides, knows its samosas from its chutneys. 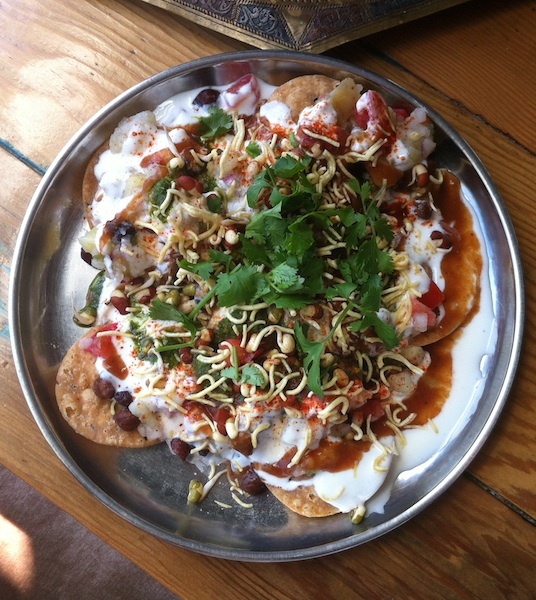 The papri chaat, housemade crackers topped with chickpeas and potatoes drizzled with yogurt, tamarind chutney and cilantro, were fresh, creamy and crunchy and a great starter to munch on while we decided what else to order. 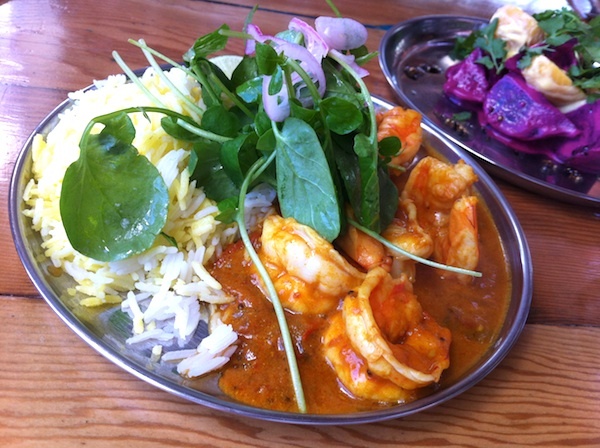 Goan-style shrimp was several big, juicy, tenderly moist shrimp in a rich coconut chile sauce with saffron rice. The beet salad, chunks of roasted beets with coconut milk and curry leaves, was one of the best beet dishes I've ever had and may be making an appearance here at the house this summer. I have to say that the dal, described as lentils simmered with spices, was a little blah compared to the other dishes but was far from disappointing. Suffice it to say that this is a great, reasonably priced place to stop in for a snack or meal, and one that may draw you in again with its magical allure. Details: Bollywood Theater, 2039 NE Alberta. 971-200-4711. Another magical place that draws me back again and again to its deep Southeast location is the Eastmoreland Market & Kitchen. 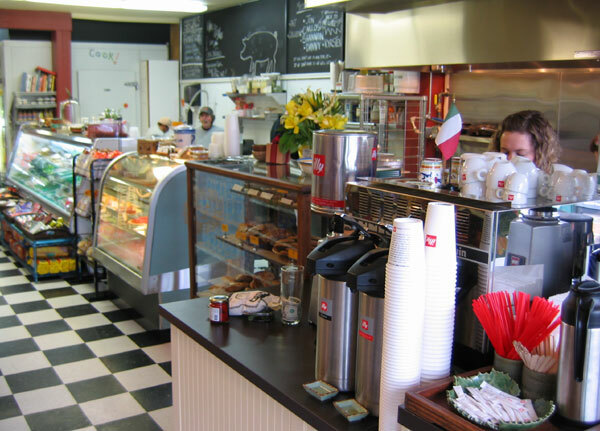 Partly it's the Brigadoon-like surprise of finding not just a cute little café buried deep in the tony neighborhood surrounding Reed College, but more because of the consistently outstanding quality of its offerings, almost all of which are made on the premises. In the morning its a sleepy little meeting spot for parents who've just dropped their kids off at nearby Duniway grade school or a place for dog-walking denizens to get their caffeine on. At lunch there are a dozen or so sandwiches on offer, most served with a side of chips and a wedge of nice pickle, along with deli salads from the case and daily soups. 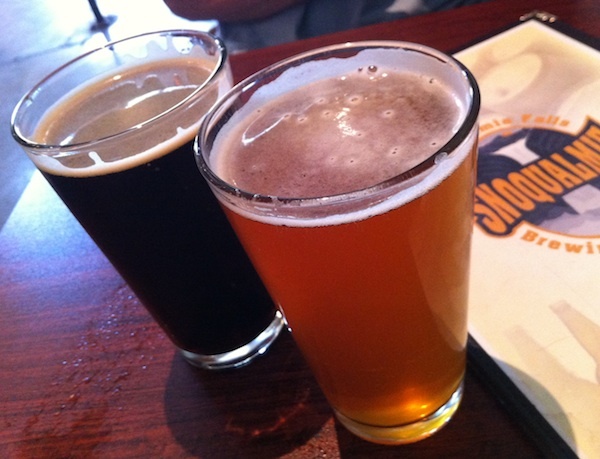 Afternoons are dedicated to the previously mentioned coffees and menu items, plus beverages that include beer, wines and sodas. There's also the "market" side of the mathematical equation, which offers a broad selection of imported foods, meats and cheeses plus basics like boxed cereals and sundries, and they do a good business in take-out cold cuts and dinners from the kitchen before they close in the early evening. A lunch stop the other day during one of the aforementioned dog-walking junkets had me ordering the house Cubano (top photo), a hefty roll packed with house-roasted pork, ham, assorted pickled vegetables and aioli that was mouth-wateringly satisfying. 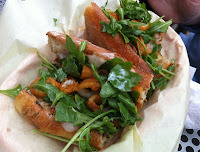 My dining and walking companion ordered the bocadillo de calamari (right) featuring fried calamari on a baguette with jamon serrano, manchego and aioli, a nigh-perfect combination of fried crunchiness and tender squid with an underlying smokiness. Wow. 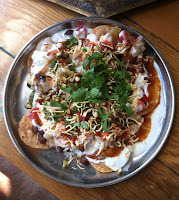 I'd encourage you to seek out this little under-the-radar gem whether or not you've got errands in the neighborhood. It's that good. Details: Eastmoreland Market & Kitchen, 3616 SE Knapp St. 503-771-1186.